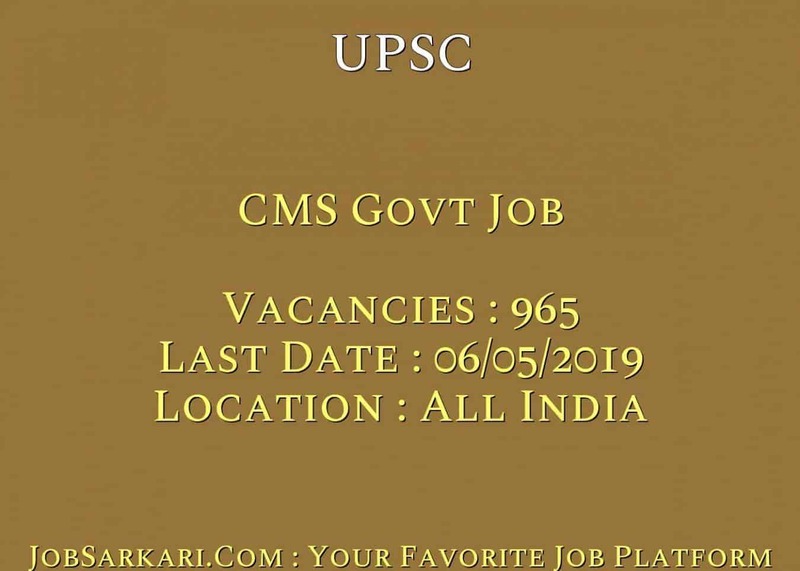 UPSC CMS Govt Job 2019 Syllabus Check Here. UPSC Notification is out. UPSC is recruiting for 965 CMS Govt Job Posts. You can check UPSC - Union Public Service Commission last date, download UPSC notification, visit UPSC official website and check other UPSC Vacancy details.Complete Vacancy and recruitment Details about 965 CMS Govt Job vacancies in UPSC are provided below by JobSarkari.Com only for you. Last Date of Apply Online. 06/05/2019. Last Date of Offline Print. 13/05/2019 to 20/05/2019. SC/ ST/ PH/ Female. No Fee. Mode of Payment. Candidate Need to Pay Application Fee Through Net Banking, Debit And Credit Card or Through SBI E Challan. Assistant Divisional Medical Officer in the Railways. 300. Assistant Medical Officer in Indian Ordnance Factories Health Services. 46. Junior Scale Posts in Central Health Services. 250. General Duty Medical Officer in New Delhi Municipal Council. 07. General Duty Medical Gr.II. 362. Candidate Must Have Passed MBBS. 2. Click on the Registration Part I Link As Given on our Website in Important links Section. 4. After That Candidate Have to Go For Registration Part II As Given on Our Website. 5. Candidate Have to Upload Photo And Signature As Prescribed Size And Format And Need to Save Data. 7. After Successful Registration Candidate can Log In with Registration No. and Password for Payment of Application Fee. 8. Please Remember and Save your Registration No And Password for Further References. 9. Online Application can be Submitted on or Before 06th May 2019. Q. What is the Last Date For UPSC CMS Govt Job Vacancy ? A. 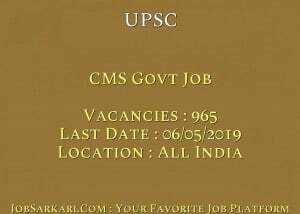 Last Date for UPSC CMS Govt Job Posts is 06/05/2019. Q. What is the Form Type of UPSC CMS Govt Job Recruitment ? A. The Form Type for UPSC CMS Govt Job Posts is Online. Q. How many vacancies are available in Union Public Service Commission CMS Govt Job Posts ? A. There are about 1000 Vacancies in Union Public Service Commission CMS Govt Job Posts.